The Toki No. 325 bullet train on the Joetsu Shinkansen Line was running at 210 kph when the first of a series of powerful quakes hit Niigata Prefecture shortly before 6 p.m. Saturday evening. the train was derailed - the first time a bullet train left the tracks since such trains began running with the launch of the Tokaido Shinkansen Line in 1964. When a seismometer detects a tremor equivalent to an intensify of 4 on the Japanese scale of 7, the power supply to bullet trains is automatically cut off so they will halt without human intervention. The first quake automatically shut down the power supply, activating a brake system. 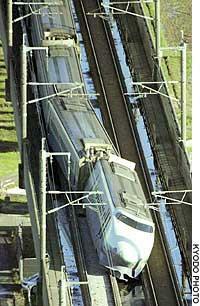 Eight of the train's 10 cars derailed, and the last three cars were left tilted sideways by as much as 40 degrees.